Unearthing Global Flavors Locally in the Peel-Halton Region and Beyond. Adonis Market Opening April 17, 2013 in Mississauga! Spice up your holiday potluck party with exotic and inexpensive finger food that will please the palates of adventurous eaters and vegetarians. Easy peasy; no cooking required. Pick up an assortment of restaurant-quality, sweet and savory, vegetarian Indian baking from Mississauga’s White Gold Food. 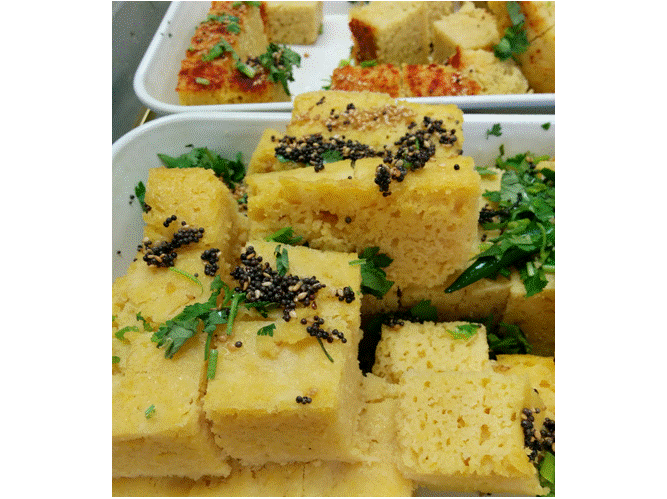 Dhokla is a moist, savory cake made from chickpea flour and yogurt – a healthy dose of fibre and protein. The regular “non-spicy” version has a garnish of tempered black mustard seeds, sesame seeds, hot green chiles, and fresh coriander leaves: gentle heat and fresh green flavour against the mellow nuttiness of the chickpeas and tang of the yogurt, all in one deeply satisfying bite. The “spicy” version is made with ginger and green chiles and is dusted with chile powder – take a walk on the wild side, this baby is hot. Serve with very spicy, hot green chutney (coriander, green chiles, and yogurt) but lovely just solo. Of course, samosas are always a big hit at a party and White Gold’s samosas are delicious. Choose regular; the spice level is just enough to give a golden warmth. Apparently, the spicy version is not for the faint of heart. Serve with tangy-sweet tamarind chutney….mmm! I’ve never been a pakora fan (those often greasy, tasteless globs of fried batter with a hint of vegetables). But White Gold has awoken the inner pakora lover in me. 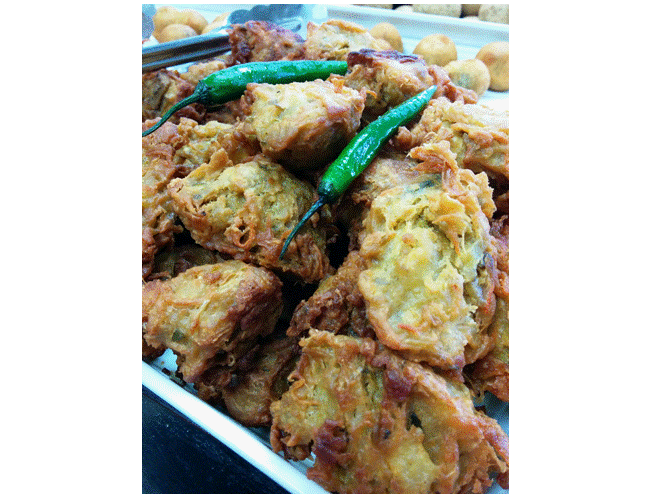 Their pakoras are not greasy and are packed with a flavourful combination of potatoes, onion, spinach, carrots, eggplant, and cauliflower in chickpea batter, fried to perfection. Some Indian desserts are almost sickly sweet but there are a few that I like in small doses and White Gold makes them mouth-watering. Burfi means fudge. I adore White Gold’s mango burfi (middle right): tangy, pure mango pulp balances the rich sweetness of the fudgy evaporated milk. 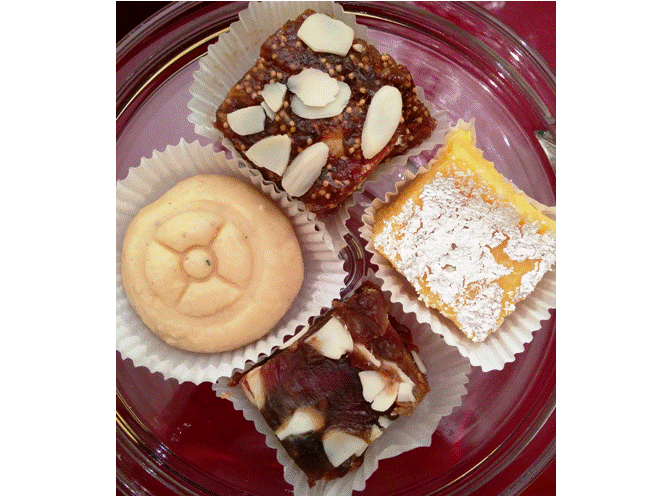 Anjeer burfi (top) is made with figs and almonds while Khajoor burfi (bottom) is made with dates and almonds. Elaichi peda (middle left) is like a cross between shortbread and fudge: sweetened evaporated milk dumplings made with the very best cardamom. Owned and operated by a local family who use only top quality ingredients and prepare their authentic products with the utmost care. White Gold supplies their quality baking to restaurants and markets but thankfully, they have a storefront take-out counter, filled with all sorts of goodies, open to the general public. Google maps has pinned the address incorrectly on Laird. It is at the back of 3176 Ridgeway in unit #48. At this time of year, I love seeing the Diwali lights and fireworks across our city. Happy Diwali! Bring an empty picnic basket to Georgetown’s Mill Street Cheese Market and load up with a moveable feast of well-crafted, artisanal cheese and other goodies. We chose a delicious Scottish Claret Cheddar (surprisingly creamy with fruity red wine notes), a luxurious Grand Crème Delin triple cream from France, and a decadent St. Agur (our true-blue friend that never fails to please). Store-made baguette crisps are the perfect foil. Melt-in-your-mouth, spicy Mennonite summer sausage and pickled hot-n-sweet cherry peppers balance the richness of the cheeses. And to refresh, the French version of lemonade, a sparking limonade by Rième. On your way, pick up some seasonal fruit from a local farm market (Alisons’ Farm Market or Georgetown Farmers’ Market). Find your favourite secluded spot – perhaps in a vintage orchard or at the edge of a babbling creek. Spread out and then lose yourself in midsummer’s magic: gentle breezes, chirping crickets, happy butterflies, perhaps a glimpse of a timid deer. Summer celebrated in one afternoon, a lifetime of love in one moment. on a beautiful farm near Lake Erie, Ontario. And a recipe for an easy nibble, perfect for sharing with your own treasured friends this winter. My contribution to the evening was my take on tartine: little open-faced French sandwiches that I layered with fruit and cheese, sprinkled with nuts and thyme, and drizzled with honey. We arrived at the farmhouse late so I threw the tartines together too quickly and sloppily as you can see in the photo. But they tasted delicious – feel free to be as sloppy or as artful as time permits. Serve with a salad for lunch or as a substantial snack to share with a glass of wine. Ask your bakery to slice your baguette for you (the slices will be uniform thickness). Prep all your ingredients ahead (except for the fruit) and store separately in airtight containers. For larger crowds, double the recipe and make a variety, using all cheese and fruit listed. Stick with one type of fruit and cheese per tartine. Because I knew I would be short on prep time when arriving at the farm, I used some pre-sliced cheese: Les Tranches Cremeuses des Pays de Loire (Coeur de Lion, France) as brie/camembert. Preheat oven to 375°F. Arrange baguette crisps in a single layer on baking sheet. Quarter, core, and thinly slice fruit. Top each baguette crisp with cheese and fruit of choice, in alternating, peek-a-boo layers (from two to four layers total, depending on your quantity of slices). Sprinkle with nuts, thyme leaves, and black pepper. Bake for a couple of minutes, just until cheese melts. Remove from oven, transfer carefully to serving platter. Drizzle with honey. Garnish platter with extra thyme sprigs. Serve warm. Gather your friends around, tuck in, and enjoy. Preheat oven to 400°F. Brush each slice lightly with olive oil. Spread out in a single layer on a baking sheet. Toast about 3 minutes, just until slices are beginning to become golden at the edges. Sprinkle very lightly with fine sea salt. Cool. Store in an airtight container until ready to use. Ring in 2015 with a fun, progressive feast of foods from around the world. Serve as timed courses on small plates, buffet-style. Start with Russia and end up with Canada at midnight to symbolize the dawn of 2015 as it passes across our wonderful Mother Earth. 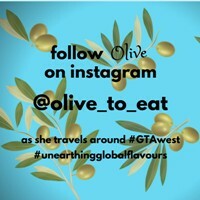 Olive’s made it easy with lots of suggestions for countries and ready-made food to pick and choose from. You don’t have to serve it all or run yourself ragged buying exactly what I suggest – let my ideas conjure your own neighborhood favourites. 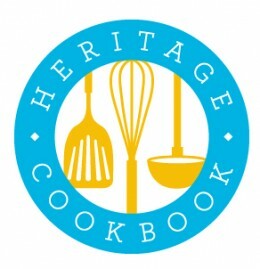 Call ahead to pre-order wherever possible or stock your freezer well in advance to avoid last-minute disappointment. If you want to decorate, set out a collection of vintage alarm clocks (from around the house or your local thrift shop) with alarms set for each course. If the clock is not working, set the time on the clock to match the time of the course and place it beside the course. Or make your own paper clocks using a printout. A vintage globe with a retro peace banner would make a charming centrepiece. Add some sparkle and glitter wherever you can. Click on the photo for a link to this DIY peace banner. Start the night off on the other side of the planet, in Russia. If you are welcoming your guests with a cocktail, Sable & Rosenfeld has a great line of pickled cocktail garnishes – and you don’t need a cocktail to enjoy them. Available in grocery stores and specialty food markets. Click here for locations. I love the Garlic & Dill Tipsy Cocktail Stirrers. Serve simple but luxurious smoked salmon with slices of buttered black bread. Starsky Fine Foods sells a gorgeous vodka-infused smoked salmon. Click here for locations. Keep it simple with a bowl of freshly boiled edamame (green soybean pods widely available in the frozen food section of your grocery store). Lightly boil according to package directions, drain well and toss with crunchy sea salt. Serve in a pretty bowl with a side bowl for discarded pods. To eat, place the pod in your mouth while holding the opposite end; use your teeth to gently squeeze the beans into your mouth and then discard the empty pod. Or order a tray of ready-made sushi. My favourite, local take-out sushi is Mac’s Sushi (Erin Mills Town Centre and other locations). I love their Spicy Crunch Vegetable Rolls. Hot or cold spring rolls make easy finger good. Fresh or frozen options abound in your local grocer. I love the store-made Handmade Vegetarian Spring Rolls at Mississauga’s Michael-Angelo’s (Erin Mills and Folkway). Crispy on the outside and stuffed with a generous filling of shredded cabbage and other veggies – so fresh tasting. Call ahead to pre-order. Pick up in foil tray and reheat gently. Banish boring bbq meatballs from your party and spice up the night with meatballs simmered in an Indian-spiced sauce. Costco sells delicious chicken meatballs in a spicy tikka masala sauce: Sukhi’s Gourmet Indian Foods Masala Meatballs. Call your Costco ahead to make sure they stock them. Olive’s taken a shine to Vij’s Delhi-Licious Kettle-cooked Potato Chips made by Neal Brothers Foods Inc. and wonderfully spiced by Vikram Vij, owner of world renowned Vij’s Indian Restaurant in Vancouver, BC. Great balance of spicy, salty, sweet. I found them at Goodness Me (Mavis and Bristol). Pick up your favourite Middle Eastern dips like hummus, baba ghanoush, or muhammara and serve with pita triangles for dipping. Adonis sells really good, ready-made versions of all three plus wonderful, fresh pita (baked in-store) to serve with it. If you can’t get to Adonis and have a hard time finding the less common muhammara, you can make my recipe ahead. Lots of choices for Europe and United Kingdom. Here are just a few suggestion. Starsky Fine Foods has lots of delicious, ready-made Polish food including pierogies, delicate crepes stuffed with cheese and spinach, or Victorian Salad (Polish potato salad with peas and carrots that you could serve on endive spears). …and for Spain, you could switch out the peaches for pears in my Peaches with Serrano Ham, Creamy Blue, & Honey. French ideas include pâté. I adore Spirit Tree Estate Cidery’s luxurious Pâté with Ice Cider & Shallots sold in a charming ceramic pot. or marzipan from Belgium (available at the Cheese Boutique). or even Dutch syrup waffles from your local grocer. You will likely be popping champagne, so a cheeseboard featuring Canadian cheeses that work well with champagne would be your easiest choice. Ask the local experts at Cheese Boutique (Toronto), Mill Street Cheese Market (Georgetown), or Cheese Shoppe on Locke (Hamilton) for advice. My Cheese Market directory lists all of their contact info. You could also consider serving cold PEI lobster salad in shooter glasses or on individual spoons, crackers, or puff pastry (click photo for recipe suggestion). Finish off on a sweet note with the quintessential Canadian dessert, butter tarts. Butter tarts from Kate’s Town Talk Bakery. However you wish to celebrate it, have a healthy and happy 2015! One stop at Cheese Boutique and all stocked up with gourmet treats for the holidays! Christmas is the perfect time to indulge in fine cheese. So easy for entertaining, so luxurious. I asked the experts at Cheese Boutique to describe three cheeses they might like to serve on their own cheeseboard this Christmas. Brebiou: a sheep’s milk cheese from the Basque region of France. Very ripe due to its 4 months of wet aging. Quite mild with a nice finish. Glengarry Celtic Blue: a soft, creamy cow’s milk blue with a mild, buttery flavour. Produced in Glengarry, Ontario by award-winning Glengarry Fine Cheese. Majestic Henry: A pasteurized cow’s milk cheese, aged in barley and Samuel Adams Boston Lager. Developed by Cheese Boutique co-owner Afrim Pristine in conglomeration with Samuel Adams. Made in Quebec exclusively for Cheese Boutique. Aged 6 months in-house. Named after Afrim Pristine’s dog (the rind resembles his coat). Go for the glorious cheeses and come back with so much more. Cheese Boutique is brimming with gourmet goodies from around the world. Cole’s Great British Christmas Pudding from England, Kirriemuir Gingerbread with Candied Orange from Scotland, JCQ Almond Filled Pastry Ring from Holland, and DiGennaro Marrons Glacés from Italy are just some of the special Christmas treats. and adorable, little marzipan pigs. I am smitten with these beautiful marzipan squares from luxury Belgian chocolatier Neuhaus. It’s beginning to look a lot like Christmas! You’ll find great gourmet stocking stuffers, hostess gifts, and special delicacies to make your Christmas extraordinary.